At this year's NAB mLogic are introducing their new Thunderbolt 3 RAID drive mSpeed, coming as two versions with either 8 or 12 removable drive bays. mSpeed will be sold as bundle with Kyno for efficient media browsing, filtering and screening - at lightning speed, straight from the drive. To celebrate the launch of mSpeed, the first 50 units sold will contain a free license of Kyno, so make sure you get it while it's hot! Once those are used up each unit will include a 25% coupon on the regular price. For more information about the mSpeed drive, visit the mLogic site. If you've purchased an mSpeed drive and you're looking to redeem your promo code, please visit the mSpeed landing page. 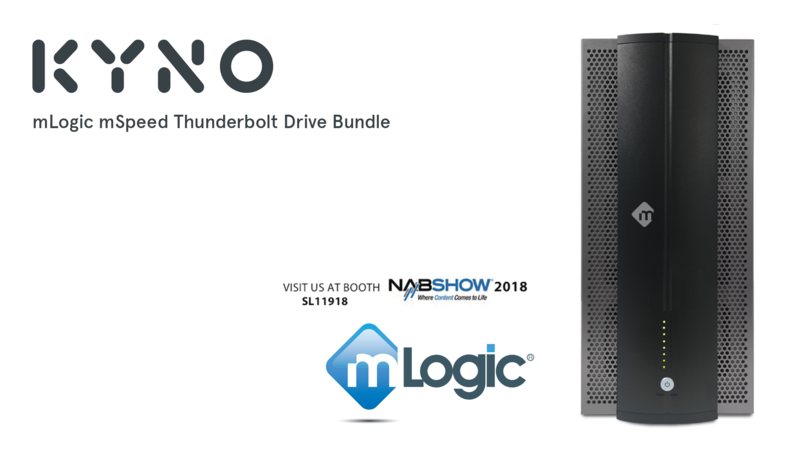 You can see the new drive and get more information on the bundle including a demo of Kyno at mLogic's booth at the NAB show 2018, booth SL 11918 (South Lower hall).